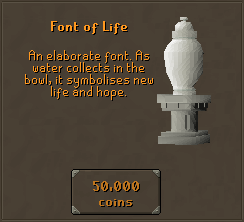 Gravestones are very useful in RuneScape. Their main use is to keep the items that are dropped whenever you die. When someone dies, they have a certain time limit to return to their gravestone and retrieve their items before it degrades and the items are lost forever. The time limit depends on which gravestone you own. Only the person who died can retrieve their items. They can do this by walking over their gravestone and picking up the items dropped upon death. By right-clicking on a grave, you are able to repair it or bless it. Repairing lets the grave last up to five minutes longer while blessing lets the grave last up to a full hour more, depending on the prayer points used. To bless a grave, you need to have a minimum of level 70 Prayer. Repairing other's graves costs three prayer points. 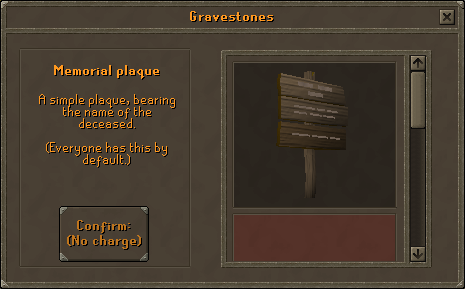 Another interesting feature about gravestones is that if you are a member and buy a grave from Blasidar, that grave will show up on a freeplay world! 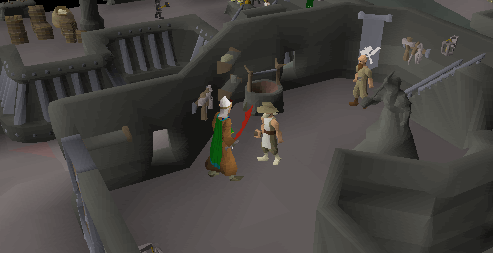 An "instance" is a special area in RuneScape such as the area used during a boss battle. 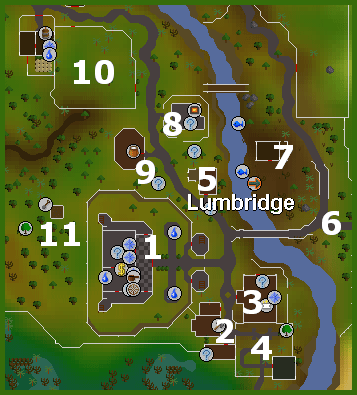 If you die in one of these areas, your gravestone will apear in the closest location outside of the instance area, rather than the exact location you died. 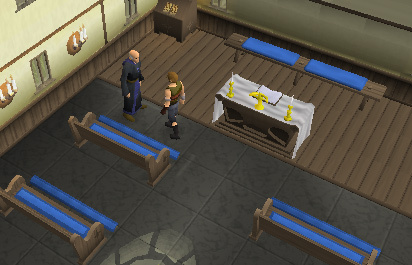 To buy a gravestone, you need to talk to Father Aereck in the Church in Lumbridge (#3 on the map of Lumbridge) after completing The Restless Ghost quest. 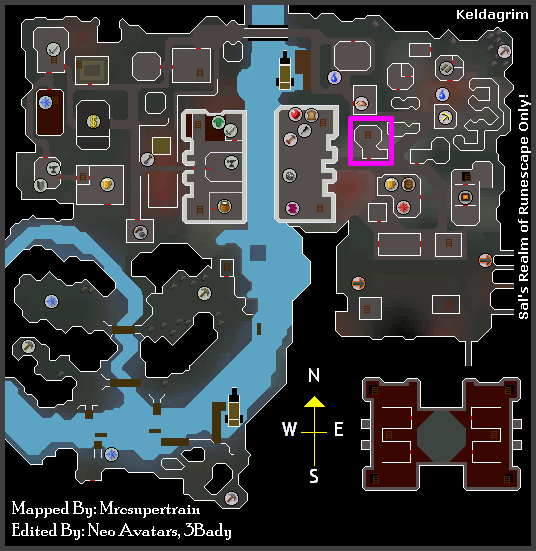 Members can also talk to Blasidar in Keldagrim (In the pink square on the map) after completing the Giant Dwarf quest. It is the generic sign that everyone starts out with, so it only lasts five minutes. It is, luckily, free to any adventurer who wants to have it. 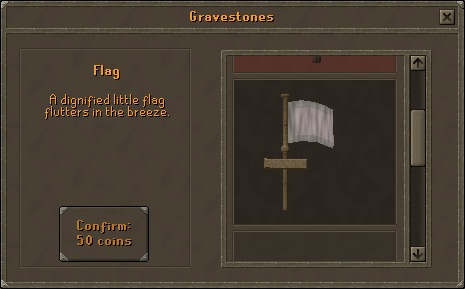 This flag symbolizes the place that you died, giving you six minutes to get back to your items. 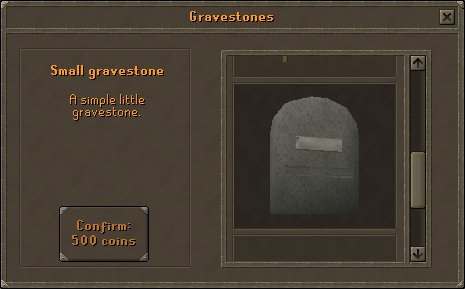 This small, simple grave lasts a mere six minutes, giving you just enough time to get your items back. This ornate and grand gravestone last for a nice even eight minutes. It is the best grave available to freeplayers. This grave lasts for ten minutes, until new life is created by the water collected into it. This ornate grave honors the three more known gods, giving ten minutes of time to get back to it. 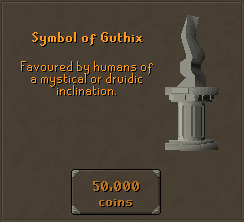 This grave pays tribute to the god of nature and balance, Guthix. It lasts for ten minutes, preserving the balance of this world. 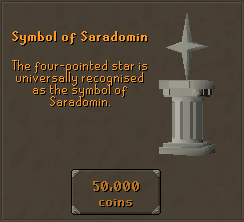 This 50,000 coin grave is dedicated to the god of order, pleasantry, and wisdom, Saradomin. The grave lasts ten minutes, in order to preserve your wisdom. 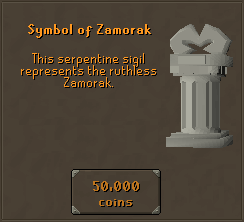 This 50,000 coin grave is dedicated to the mighty god Zamorak. The fury of the god of chaos keeps it standing for ten minutes. This grave lasts for ten minutes. This grave requires completion of the quest, Land of the Goblins. 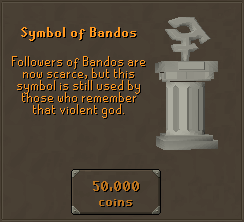 This one honors the Bandos warriors who fought in the God Wars! This grave lasts for ten minutes. 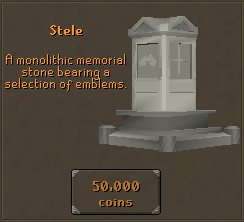 This grave requires completion of the quest, Temple of Ikov. 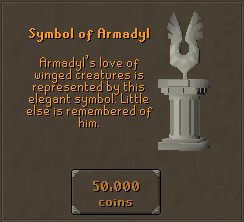 This grave honors the great bird gods! This grave lasts for ten minutes. This grave requires completion of the quest, Desert Treasure. It pays tribute to the ancient gods from before the time of Azzanadra. 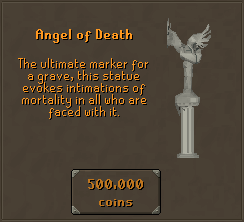 The Angel of Death gravestone is one of the largest gravestones, so it will cost a whopping 500,000 gp! Of course, such an extravagant gravestone has its benefits. It will remain standing for 12 minutes without a repair. 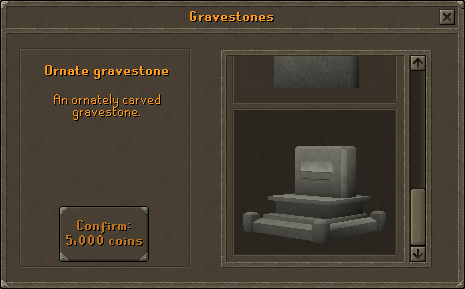 The Royal Dwarven Gravestone is the largest gravestone currently available in RuneScape. 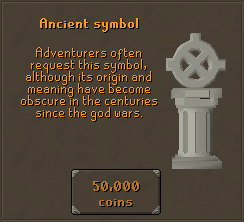 It costs 500,000gp to buy, and requires the completion of the King of the Dwarves quest before you can use it. It will remain standing for 15 minutes before collapsing. In conclusion, gravestones are the only chance to retrieve your items after you die, so be sure to hurry back if you die! If someone dies near you, be helpful and bless or repair their grave.